This verson includes 3 additional tools, and another option to the existing Cleanup Project Code tool. Here’s a description of what’s new. This tool allows you to batch rename all controls on a userform via a simple Find and Replace interface. 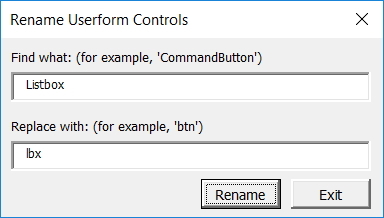 In addition to changing the control names, it also changes code with the old control name to the new control name. So, if you want to change all controls that start with “CommandButton” to “btn” or “cb”, etc, this is the way to do it all at the same time! The bigger the project, the more complex it becomes. This tool analyses your code and makes a list of variables and constants. More features are planned in the near future. If you need to show your code on the web, normal indenting won’t show. The way to get around it is to convert indent spaces to “&nbsp;”. This tool does that and copies the code to the clipboard so you can paste it where required. This feature was added at the request of Kellsens Willamos, who has supported me and the development of these tools from the beginning. When developing, did you ever click userform controls by mistake? Maybe you get something like this. Chances are you don’t want the code, and if there’s nothing between the first and last line, it’s a fair bet that you don’t. 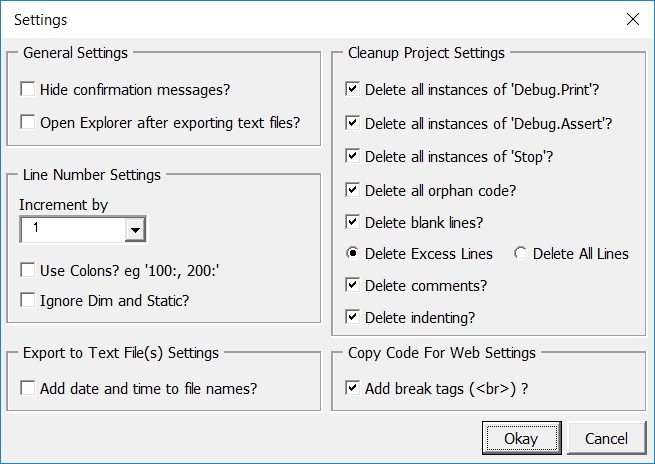 The Delete Orphan Code tool looks for code like this and gets rid of it. I’ve added it as an option on Cleanup Project Code. To include it, tick the checkbox on the Settings form. P.S. I’m looking for affiliates and translators. If interested, email me at aengwirda at gmail dot com.